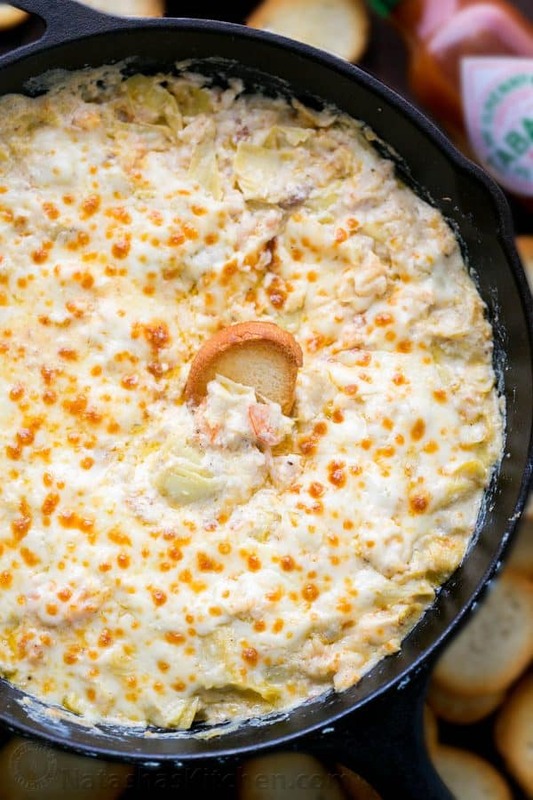 Hot Shrimp Dip is the ultimate game day or party appetizer. 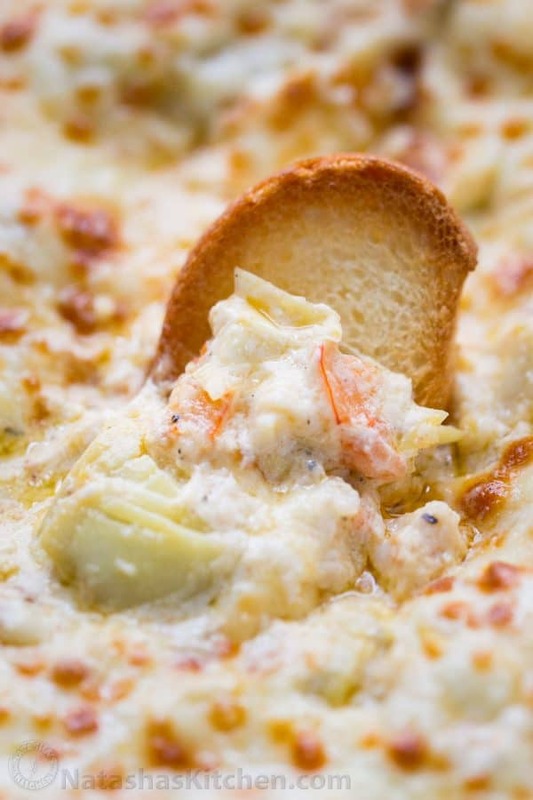 It is creamy, cheesy and loaded with shrimp and artichokes. 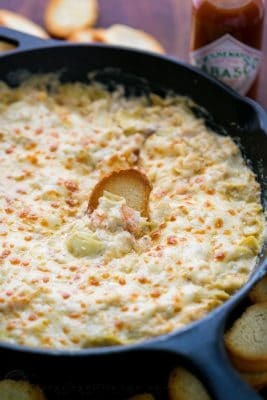 This shrimp dip recipe is made in one pan, preserving every bit of shrimp flavor. 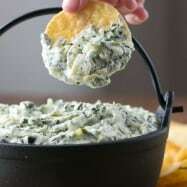 If you enjoyed our spinach artichoke dip, you will LOVE this! My son ate about a quarter of the dip and exclaimed, “Mom this is sooo good! 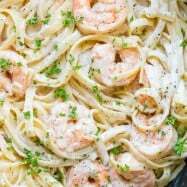 Make this for my birthday – this can be my birthday cake!” The funny thing is, he was totally serious and completely smitten with this shrimp dip. It really is THAT GOOD! 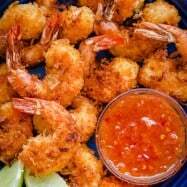 Can I use Pre-Cooked Shrimp? Making your own crostini is the easiest thing and will give your appetizer a sophisticated touch. 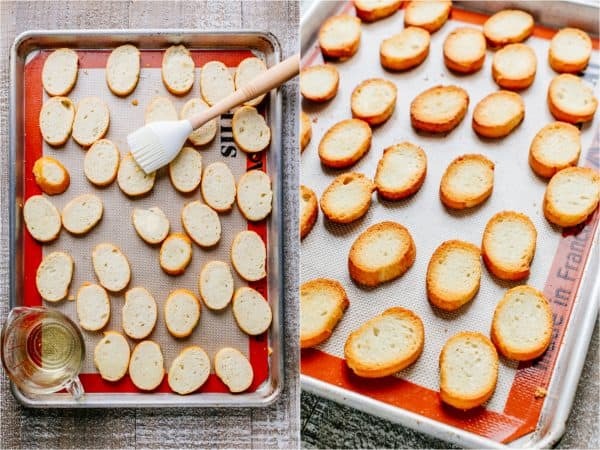 A perfect crostini will be golden at the edges and have slightly soft centers. Brush both sides of bread lightly with oil. Place on a baking sheet and bake at 400˚F for 6-8 minutes. Done! 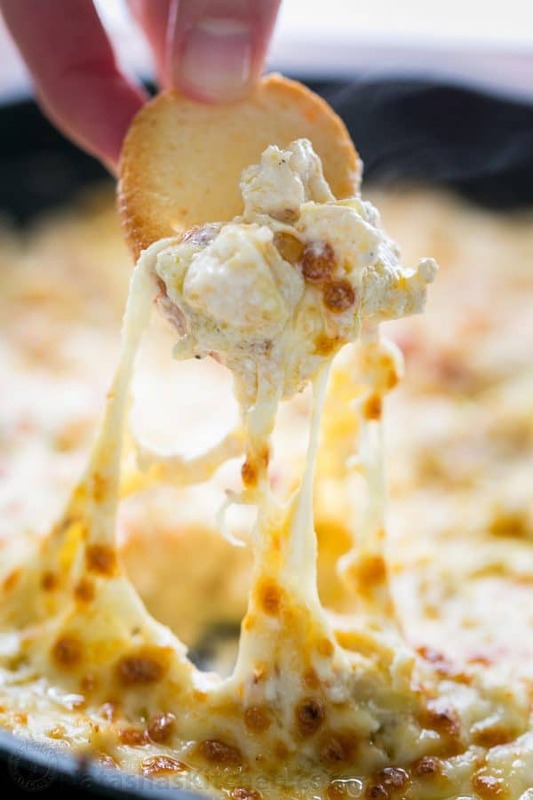 Do cravings for hot cheesy dip hit you every time you watch this? If you enjoy our video recipes, please subscribe to our Youtube Channel and click the bell icon to get notifications when we post a new video. THANK YOU for subscribing! This hot shrimp dip is the perfect appetizer. 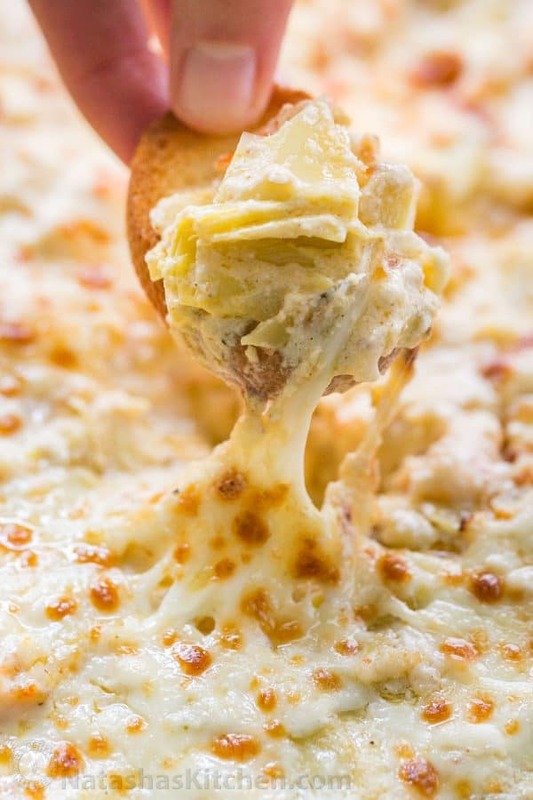 It's easy, creamy, cheesy, fully loaded and boy is it ever good! If pressed for time, serve with pita chips or low-salt tortilla chips. Preheat oven to 400˚F. Brush both sides of bread lightly with olive oil, place on a baking sheet and bake 6-8 min - toasts should be golden at the edges and slightly soft in centers. You can also toast the breads on a large skillet. Heat a large oven-safe skillet or cast iron pan over med/high heat. Add 1 Tbsp butter to the hot skillet then add shrimp in a single layer and season lightly with salt and pepper. Saute 2 min per side or just until cooked through. Transfer to cutting board to cool slightly then chop into pea-sized pieces. In the same pan (no need to wash it). Melt together 3 Tbsp butter, 8 oz sour cream, and 4 oz cream cheese. Stir in 6 oz (or three fourths) of shredded cheese. 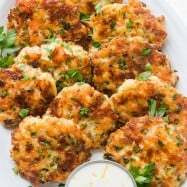 As soon as cheese is melted, add drained chopped artichoke, chopped shrimp meat, pressed garlic and 1 Tbsp Tabasco, or add to taste. Stir together until mixture is hot and bubbling then remove from heat. Sprinkle top with remaining 2 oz of shredded cheese and broil in the oven 3 min or until cheese is melted, bubbling and golden in spots. This post was previously published in 2016 and some of the text and photos were updated. 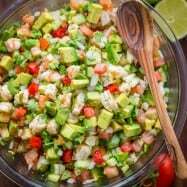 Make this for your next holiday get together – it disappears fast! If you’re lucky enough to have leftovers, this shrimp artichoke dip reheats really well on the stove, in the oven or microwave and it’s as tasty as the day you made it! Fabulous, fabulous, fabulous, did I say fabulous? Fabulous recipe. I had some minor challenges trying to figure out the sequence of steps. Do you make the crostini first? Tabasco is one of my favourites/favorites. 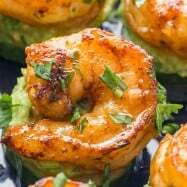 Please pass on my comments and request for more great Natasha’s Kitchen Tabasco recipes. Natasha, my partner Kyle and I love your recipes, and love getting ideas from your videos. Your dishes are always user-friendly and so tasty. Thanks!!! The 21 to 30 count more flavourful even if chopped up IMHO. :)Just my quirk. Hi Natasha, I would want to make this for a party but I have to travel an hour. Any recommendations on how I can (if I can) remake this and then heat it up??? ?